It's Not Too Far to Walk Huntingdon! Walk Huntingdon Community Partners (WHCP) invites anyone who wishes to support this initiative to join in Walk Huntingdon's Earth Day Walk on Friday, April 22, 2016. Participants will meet in front of Juniata College's Halbritter Center for Performing Arts at 8:30 a.m. and will be greeted by local students, Rachel Payne (JVHS) and Madison Troha (HAHS). Between 8:45 a.m. and 9:00 a.m. the Earth Day Walk will commence. Participants will conclude the Earth Day Walk at Portstown Park, where Mayor DeeDee Brown will greet participants. Walk Huntingdon encourages individuals to choose to walk. 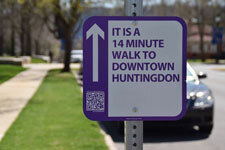 By indicating the number of minutes it takes to walk to a designated location, Walk Huntingdon signs demonstrate that "It's Not Too Far" to walk. The signs encourage practices that are healthy for individuals and for the environment. Walk Huntingdon Phase I consists of 38 signs placed along Walk Huntingdon’s Central Corridor from 18th Street along Moore Street and 7th Street to Portstown Park. Each of the signs is color coded according to the given destination's purpose. Purple is for commercial entities; green is for public spaces; orange is for amusement; blue is for civic / institutional entities; and pink is for transit. Pedestrians can scan each sign’s QR Code with a smart phone and access written directions and a map.